We are lucky in having Martins Haven and Deer Park only a short drive away. They are some of my favourite places to go for a walk, especially Deer Park-it’s lovely to get right up on the cliff top and have that fabulous sea air blowing all the cobwebs away and giving your batteries a re-charge-I just love it! Ollie boy loves it too, and I don’t mind taking him there seal pup watching, as we are so far up above the pupping beaches that I can be sure that Ollie won’t stress the seals at all. Martins Haven is another matter however, as the pups are literally right infront of you on the main beach there. Well, they were last year! There were 2 quite often ticked away in the rocks but there was one really fat pup right in the middle of the beach, and one just by the footpath you would tread to catch the boat over to Skomer-right in the line of public gaze. Having said that, from what I saw, they didn’t seem to get stressed out at all by it. They just took it all in their stride. 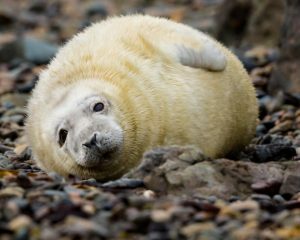 Pupping season has now started and will go on until about November, but the pups are seen on the beaches well into December and beyond. 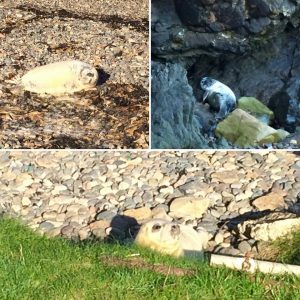 In fact, very nearly as the Puffins leave Skomer, the seal pups start appearing-so there’s always a reason to come and visit our beautiful Pembrokeshire. 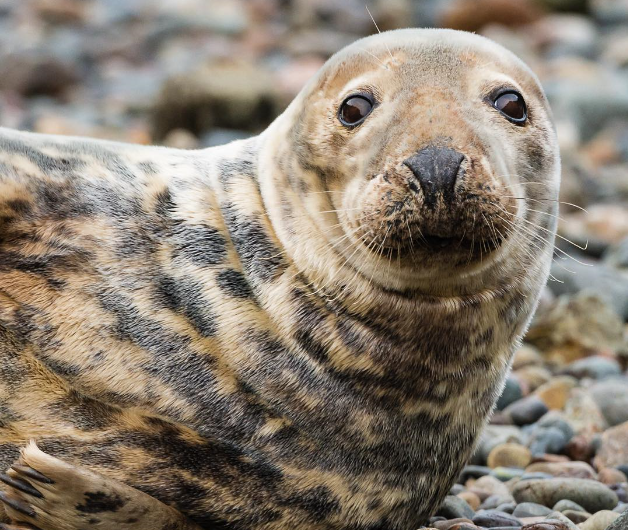 Of course, you can seals all year round here, there’s just something very cute about the seal pups and so I do get a bit more excited at this time. Last year, at one of the pebble beaches at Deer Park, one Sunday afternoon, I counted 14 pups! Take a good camera and you’ll get some great photos, although I’ve only ever got my iPhone with me and I still manage to get some great shots(no critics please-I’m a novice!). But who was it sad: ‘the best camera you can have, is the one that is with you’…so, there you go, my iPhone will do any day!